People love their iPads, iPhones, iPod touches, and will most likely love whatever new iThings Apple comes out with in the future. They’re fast, efficient, portable, capable of nearly anything you might want a desktop or laptop computer for, but there’s a basic need in which they’re sorely lacking. No, it isn’t multiple user support, or better multi-tasking, or its lack of a usable file system (though it sure would be nice if they included some of those). It’s storage. 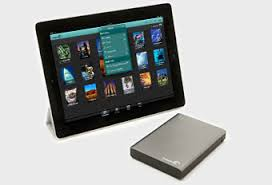 Seagate has something that will give you that storage and a lot of it! You can get an iPad with up to 128 GB of capacity, but with high definition movies clocking in at 4 to 6 GB each, that can make it really tight really fast. If you have a smaller capacity iPad (or iPhone) the problem is worse. So where can you put all the stuff you need or want if you don’t have the room on your iOS device? You can put it or access it in the cloud, but if you’re on a train, plane, or bus rocketing down the highway, that (forgive the pun) clouds your WiFi or 3G/ 4G connectivity, and you’re stuck with whatever happens to be on your device at that time. 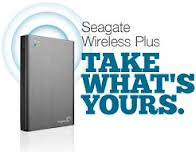 Enter the Seagate Wireless Plus. Its three sizes ensure that pretty much whatever you want to take with you, you can. High definition movies, TV shows, music, not to mention all those office files you may need. Easy to use, easy to transport, and it actually does give you a file structure (included on the device itself) that makes it snap to find the content you want. First the good stuff. It’s not much bigger than your typical hard drive enclosure and weighs just about the same, so there’s no huge bulk to worry about. It will connect with up to three iOS or Android devices (they say the Kindle as well, but I don’t have one to try it with). When connected to an iOS device, you can also use Apple’s AirPlay to push that content onto a TV set that’s connected to an AppleTV, which is handy if you’re away from home. Instead of carrying a DVD or Blu-ray player and a bunch of disks, you can just take your AppleTV, your iOS device, and the Seagate Wireless Plus filled with hours upon hours of content. Long road trips with the kids and their inevitable Are we there yet?s are much more manageable since each child’s iOS device (or Android) can be filled with whatever it is they may want to watch or listen to and they can choose whatever content they like instead of having to watch the same thing through a car’s infotainment system. Setting up the Seagate Wireless Plus to your iOS or Android device is simple, You can use their standard configuration (which is pretty basic) if you’re not concerned about locking the device down, or you can rename it and give it a password to prevent anyone else from seeing what you may have on it. Hint: I recommend adding a password. Now the “OK” stuff. 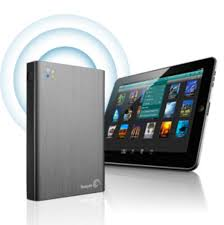 The Seagate Wireless Plus’s user interface is handled through Seagate’s free app (essentially a browser). The app itself is alright; it get’s the job done, but no style points here. I understand the reasoning behind this since they aren’t allowed to play with Apple’s iOS internals, but in many ways it’s kinda clunky. To connect to it, turn it on and wait for the blue light o go solid. Then go to your device’s Wi-Fi settings and look for the Wireless Plus’s Wi-Fi signal, hit connect (enter a password if you’ve configured it for that…BTW configure it for a password), and you’re done. Back to the Seagate app, and you’ll see all the folders with your content. Speaking of which, how do you add content to it? It’s straightforward, although also a little clunky. Remove the blank end-cap and connect a different end-cap that has a USB 3 connector (it’s standard USB on the other end), connect it to your computer and start dragging and dropping files and content onto it. Why they included both end-caps is a mystery to me since it makes more sense (to me) to just have a flip cap for the USB connector. Its transfer speeds are nothing to write home about (though faster if you actually have a USB3 connector on your computer), but remember what this device’s primary purpose is. This is also how you charge it, but be advised that while connected to a computer, you can’t turn on its Wi-Fi and if it’s on when you connect it, it turns off. The good news is that a battery charge lasts a really long time: up to 10 hours which should get most people through a typical day. In the box Seagate includes the drive, a USB 3 cable, a wall charger, User’s Guide, and the aforementioned end-caps. If you’re a road warrior, or take long trips with the kids, this is a must have device for your iOS life. Heck, even if all you want is to take lots of movies without clogging up your computer or iPad this is worth it. I had a few quibbles, but overall this is a great device and one I never leave home without. MyMac review rating is 8 out of 10!